For string players at Birmingham Conservatoire, there is a weekly workshop where there are various types of musical presentations and discussions related to stringed instruments. In February of this year, two representatives from D’Addario orchestral (Tom and Lyris) did a presentation and talk about strings. In addition to delivering important information about what strings are actually made of and how they are made, they offered the chance to try a set of strings for free! I was generously sent two sets of strings: Kaplan Amo And Kaplan Vivo. Having only ever played on Thomastik Dominant and Pirastro’s Evah Pirazzi, I was so excited to try a set of new strings. As a student, my budget is often tight so I was really grateful to receive some strings as they can be quite costly – thank you very much D’Addario! 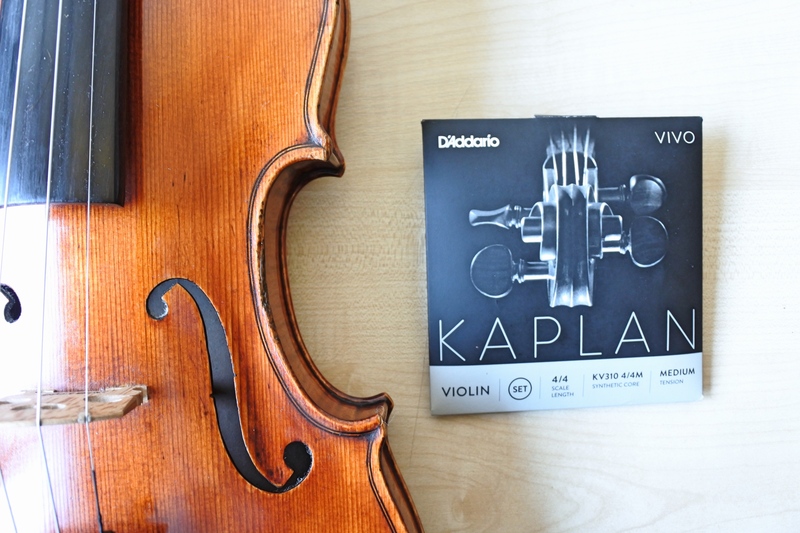 The Kaplan Vivo set were the strings that I thought would be fitting for the violin that I’m using at the moment. In the coming months, I’ll be trying the Amo set on my other instrument. In this post, I’ll be frankly and honestly reviewing this sets of strings without bias. “Kaplan Vivo delivers brilliance, clarity, and a robust feel for darker instruments…sets settle quickly, exhibiting a rich tonal color palette and superb bow response”. For a more detailed string spec click here. I have to say that I completely agree with everything that D’Addario claims about the strings. Firstly, I found that I could play on them practically straight away and therefore they didn’t take long to play in. As a first impression immediately after putting the strings on, I really felt that the strings were loud, very powerful and offered excellent projection. This aspect was great for me because they really jolted me into playing louder. At times, I can be a tentative player so the strings gave me scope to explore playing with more confidence and take ownership of such a big sound. However, the powerful projection doesn’t impede on the tone quality of the strings; on my violin they have a clear, warm, rich and resonant tone particularly at the lower end. A range of characters and colours can be achieved on the G string – I’m excited about playing Saint-Saëns Violin Concerto in B minor using these strings. At the time of my final recital (May 25th) I had had the strings on for around 2 months and for me, they still retained significant resonance, brilliance and clarity. This is so important for me. Typically, I don’t change my strings for quite a few months simply due to lack funds – #studentlife. I really appreciated this because I usually play on Evah Pirazzi and they can wear out and become dull quickly. Considering I’m a music student, I use my strings for daily practise sessions which are around 2-5 hours (depending on my schedule). In addition, I have had various concerts and orchestral courses. I cannot stress enough the durability of these strings – they’re brilliant and show now signs of slowing down anytime soon. In my opinion, after tone, durability is a crucial factor in choosing good strings in order to get good value for money. Aesthetically, I love the design and packaging. It is very sleek and professional looking. Each string comes in a sealed sleeve unlike other strings which come packaged in paper envelopes. I like to save the packaging from my strings to store spares and old strings so I liked this feature. The silking at the ball ends is a black and silver pattern which compliments the black and grey packaging. In conclusion, I really like the Kaplan Vivo strings and they complimented my violin very well. These are the type of strings that I’d use for an important concert due to the brilliant sound projection. If you use Evah Pirazzi, I’d say they are a good alternative. My only concern is the price point as online, they cost around £77 (depending on the retailer) and I usually buy my usual set of strings for £60. Due to the sheer durability, I’m willing to pay the difference. Can’t wait to try the Kaplan Amo set on my other violin!